Internal Combustion Engines more or less have had the same basic design since the first time they were created, except for the Wankel engine also called the rotary engine which did not gain a lot of popularity in the auto industry due to its short coming of inefficiencies. With the new generation of Hybrid cars which utilize a combination of electric motors and combustion Engines there is a need to develop a new design of engines and move away from the of concept of piston cylinder and valves. 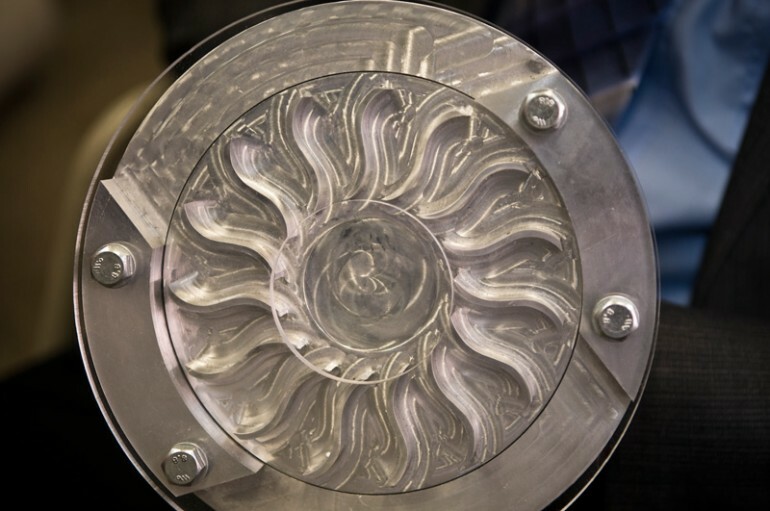 Researchers at Michigan State University have built a model prototype gasoline engine design that's unlike any other engine design seen before. It works on the principle of shock waves and utilizes what is called a 'shock wave generator', which is basically a disc/rotor having precisely designed wave-like pattern carved into channels. How this engine works is; As the rotor spins, the channels allow the air-fuel mixture to enter into the system via central inlet ports. The rotor then spins, blocking the exit of gases. As a result the pressure inside the arrangement builds ups and this generate a shock wave that compresses the mixture. 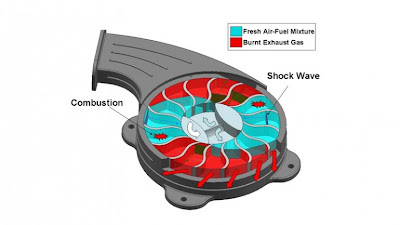 This results in igniting the fuel and which further rotates the disc resulting in generation of power, the outlet opens due to rotation and let the hot gases escape. This process continues and keeps the engine running. The man leading the Team behind the project is Dr. Norbert Muller an Associate professor of Mechanical engineering at the MSU. The major benefit of the engine is it has no peripheral moving parts. The engine doesn't require cooling system, transmission and the related fluids resulting in a lighter, more fuel-efficient vehicle. The engine can be coupled with a generator and can produce electricity which can be stored in batteries from where it could be used to drive a Hybrid vehicle. A conventional combustion engine typically only converts only 15% of its fuel energy into usable power. Dr. Muller says that the wave disc design could obtain an efficiency of 60% with the added benefit of reduced weight. If used in hybrid cars would result in 30% lighter and 30% cheaper vehicles then the existing plug in hybrids. With the added benefit of 90% less CO2 emissions. The prototype was presented to the energy division of the Advanced Research Projects Agency (ARPA-E), which is backing the Michigan State University Engine Research Laboratory with $2.5 million in funding. The team hopes to build a car-sized 25-kilowatt (33.5 HP) version of the prototype ready by the end February 2012. After all the good things said the project is still in theory and only on paper. A working prototype of the engine is yet to be seen only then the claims can be justified.